Tattoo Blog » Celebrity » Cursed? Is it possible for a specific tattoo to be cursed? I mean, can getting a specific tattoo actually have a negative/”spooky” effect on its wearer? If I had my say in the matter (and I will), then I would say no. That’s not possible at all. But a recent study by Professor Roger Byard at Australia’s Adelaide University has revealed that people with tattoos of Irish-Australian outlaw Ned Kelly are more likely to die unnatural deaths by murder or suicide. 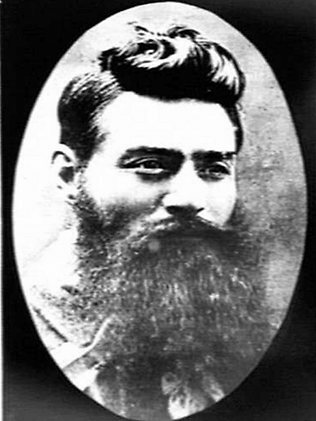 Ned Kelly was born in Australia sometime between June 1854 and June 1855 and lead a life of crime, killing three policemen and robbing two banks before being apprehended and hung on November 11th, 1880. His famous last words on the gallows were “Such is life.” Kelly’s image has often been a popular one for some Australians and Professor Byard’s study was inspired by the number of bodies in the Adelaide mortuary that he’d seen tattooed with Kelly’s image. ‘Of the 20 men with Ned Kelly tattoos that the professor studied, only three had died from natural causes – the rest were murdered or killed themselves. He also found that 11 of the 20 Kelly enthusiasts also had signs of drug and alcohol abuse. Interesting, I guess, but it seems to me that the people who are going to get a tattoo of a cop killing bankrobber might not always lead the safest, happiest lives. Okay, I know, that’s a huge generalisation, but doesn’t it make sense that getting an outlaw tattoo is a pretty badass thing to do? And if getting an outlaw tattoo is a pretty badass thing to do, then doesn’t it also make sense that people who want to do badass things also probably lead badass lives? I don’t know, just a hunch. Then again, maybe it is just one big curse. Ned Kelly coming back from the grave to reek misery and havoc on the lives of anyone foolish enough to have his image tattooed on their bodies. Mwahahahahahaha. Uh..Spooky?